SaintFrancisDam.com | St. Francis Dam Disaster National Memorial | San Francisquito Canyon. 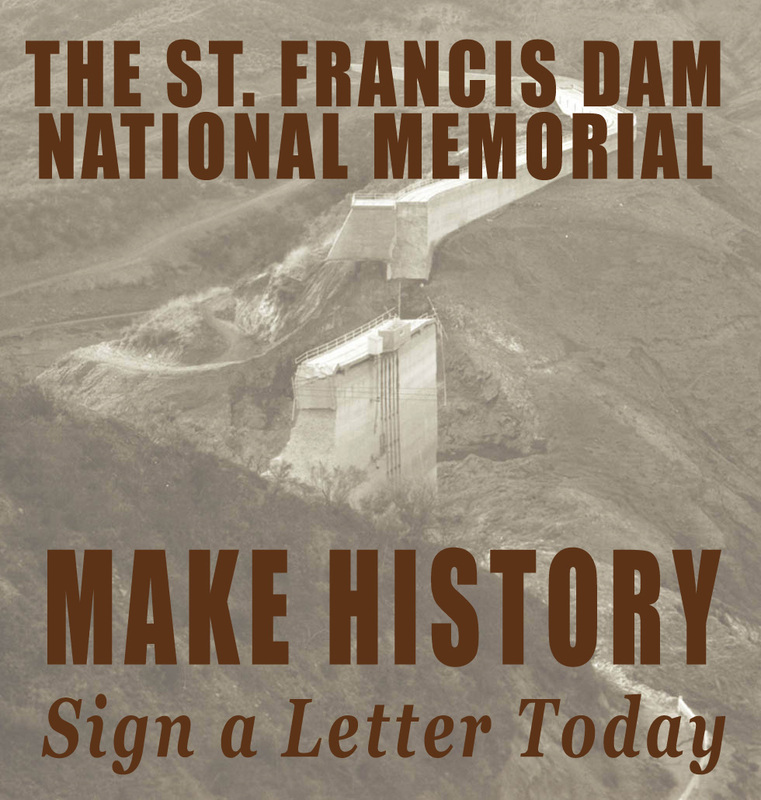 Saint Francis Dam Disaster National Memorial and National Monument • Sec. 1111 of S.47, 116th Congress 2019. HR2156: Saint Francis Dam Disaster National Memorial Act: U.S. Senate Committee Substitute • 10-2-2018. HR2156: Saint Francis Dam Disaster National Memorial Act • Introduced by Reps. Steve Knight & Julia Brownlee, 4-26-2017. Sens. Harris, Feinstein Submit Bill to Memorialize St. Francis Dam Victims • SCVNews 10-5-2017. Video - House Floor Debate: HR2156: Saint Francis Dam Disaster National Memorial Act • Congressional Record, 7-11-2017. Knight, Brownley Resubmit Dam Victim Memorial Bill • SCVNews, 4-26-2017. Video: Man-Made Disaster: The Story of St. Francis Dam • Narrated by Charles F. Outland, SCVHS 1994. 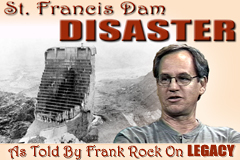 Video: Man-Made Disaster: The Story of St. Francis Dam • Narrated by Frank Rock, SCVTV 2009. Video: St. Francis Dam Disaster • The History Channel (segment). Video: Exploring the St. Francis Dam Ruins • Oddity Odysseys 2017. Engineer Suggests Ancient Landslide was Factor in Disaster • L.A. Times, 9-16-1995. The 1928 St. Francis Dam Failure and Its Impact on American Civil Engineering • Dr. J. David Rogers 2007. VIDEO: St. Francis Dam: What Led To Its Failure? with Dr. J. David Rogers • SCVTV/SCVHS/CSUN 2015.
Who Designed the Ill-Fated St. Francis Dam? • Dr. J. David Rogers 2017. William Mulholland: Father of the Los Angeles Municipal Water Supply System • Dr. J. David Rogers 2017. Program: Dedication of Calif. Historical Landmark 919: St. Francis Dam Disaster Site • SCV Historical Society, 5-21-1978. Historical Society's Dam Marker Placed, Stolen, 1978; State Marker Placed, 1979 • News Reports, 1978-1979. Report to Arizona Gov. George W.P. Hunt on the St. Francis Dam Disaster • Rep. Guy L. Jones, 1928. •Extensive report & photos of damage in the Santa Clarita Valley. NL2834 - Map of Newhall Land Property & Dam Site, 3-24-1928. St. Francis Dam Disaster. Brunner's Newhall History 1940. Memories of St. Francis Dam Disaster. Brunner's Newhall History 1940. St. Francis Dam Disaster, by Charles C. Teague (Ventura County Committee) • Excerpt from "Fifty Years a Rancher," 1944. The Day the Dam Burst by Wesley S. Griswold, Popular Science, March 1964. The Night of the Flood: The Failure of the Saint Francis Dam by Paul H. Rippens, 1998. The Rise and Fall of William Mulholland by Alan Pollack, 11-2007. St. Francis Dam Disaster: Victims and Heroes by Alan Pollack, 03-2008. St. Francis Dam: Too Big Not to Fail by Alan Pollack, 03-2010. The Chief Doesn't Deserve Ridicule for St. Francis Commentary by Pony Horton, 4-26-1998. Forgotten Casualties: CSUN Prof Hopes to Tell the Human Stories of St. Francis Dam Disaster CSUN 11-4-2013. 1928 Dam Failure: A Vital Lesson for Today Association of State Dam Safety Officials, 3-12-2018. Ruiz Cemetery Census • Eagle Scout Project, SCV Historical Society, August 1992. Ruiz-Perea Family Cemetery: A Census • Grave Markers Transcribed by Karen Murray, April 2001. Strange Happenings At Ruiz Cemetery by Leon Worden • The Signal, May 1996. HB1901 - Enrique (Henry) and Rosaria Ruiz, St. Francis Dam Victims, Ruiz Ranch, n.d.
LW2154 - Ruiz Cemetery Headstones & Census (20 Images). TS1915 - Graves of Ramon & Antonia Perea. Color photograph, 3-2002. LW2077 - William S. Hart at Ruiz Cemetery, March 1928. LT0101 - Chief Frances & Fred Cooke's Descendants Gather at Ruiz-Perea Cemetery, March 2001. TS1964 - Harry S. Chacanaca's Grave Marker, Ruiz-Perea Cemetery, 3-2002. LW060502 - Ruiz Cemetery Smolders in Fire (10 Images), 6-5-2002. Copper Fire: SCVTV News Coverage (Video), 6-6-2002 and 6-7-2002. LW3471 - Raw Video: Ruiz-Perea Cemetery, ~2004. LW2430 - Fred & Frances Cooke's Grave Marker, Ruiz-Perea Cemetery, 7-14-2013. LP2401 - August (Gus) LeBrun's Grave Marker in Ruiz Cemetery (1884-1924). SunCal Project Extends Development Up San Francisquito; EIR Misidentifies Native American Burial Site by Leon Worden • 1-10-2015. Draft Environmental Impact Report, 2006. Draft Environmental Impact Report with Appendices. LW3435 - Lady Linda Ties Yellow Ribbon; City Cuts Red Ribbon to Open Space (Mult. Views) • 10-10-2018. 1) St. Francis Dam: Forgotten, With Purpose April 10, 2009. 2) Reopening the Books on the St. Francis Dam Disaster June 12, 2009. 3) St. Francis Dam Construction Records Missing October 2, 2009. 4) Dam Disaster Whitewash Preserves Mulholland Legend March 12, 2010. 5) Failing St. Francis: Water Pressure or Political Pressure? March 19, 2010. Thornton Edwards, Hero of the St. Francis Dam Disaster 2010. NG0101 - Photo Gallery: Tombstone and Wing Dyke, March 1928. NG4025 - Hero Deputy Sheriff Eddie Hearne. NG4026 - Hero Officers Lee Shepard, Stanley Baker, John Messer. NG4026 - Hero Officer Thornton Edwards. NG4037 - Hero Switchboard Operators Reicel Jones, Althea Marks. Historic Headlines: Remembering the St. Francis Dam Disaster by Michele E. Buttelman • The Signal, 3-11-2001. Story of a St. Francis Dam Survivor by Lauren Grokett • For The Signal Zone, 11-23-2001. Santa Paula Event to Honor Heroes of Disaster Press Release, 2003. City, Survivors to Mark Deadly '28 Dam Break by Suzie St. John • Los Angeles Times, 2-9-2003. Avalanche of Water Left Death, Ruin in Its Wake by Cecilia Rasmussen • Los Angeles Times, 2-16-2003. Hart-Earp Letters Discuss Dam Disaster by Truman Rex Fisher • Letter, Los Angeles Times, 2-15-2003. Bill Hart and the Little Dam Victim by Leon Worden • The Signal, 5-17-2003. Ivan Dorset Remembers the St. Francis Dam Disaster by Leon Worden • The Signal, 2-26-2003. Survivors Remember St. Francis Dam Tragedy by Pearl Obispo • The Signal, 3-17-2003. "Breaking of the St. Francis Dam" 78 RPM Record | by John Hutchens (J. McGhee), 3-25-1928. St. Francis Dam Disaster Poem by Ron Pinkerton • 7-16-1979. "St. Francis Dam Disaster" CD Cover | by Frank Black (Black Francis), 2001. The St. Francis Dam Break • Lyrics by Dan DeVere & Jane Williams • 3-9-2003. St. Francis Dam: One Family's Ordeal • by David Desmond • Gazette, July-August 2006. New Gold Discoveries in San Francisquito Canyon Los Angeles Herald • 6-6-1897. Angelenos Petition Taft to Designate 1834 Gold Site a National Park News reports, 1910. LW2727 - Major Gordon's Station, aka Widow Smith's. Story by José Jesús López. Photo 1933. LW2282 - Major Gordon's Stage Station (est. 1859) and 1936 HABS Report & Drawings (Multiple Views). LW2740 - Major Gordon's / Widow Smith's / Delano Station: An Alternate Theory, Photo 1942. AP2319 - Perea Property / Raggio Ranch, 1887. AP1829 - Perea Property, circa 1887. GR0811 - San Francisquito Canyon, 1893. GR0812 - Gold Mining on the LeBrun Ranch, 1890s. The Mystery of the Lost Raggio Gold, News reports 1912-1914. Simeon Tucker, San Francisquito Canyon Rancher-Hotelier (1896-1902), Passport photo 1919. Geology of the St. Francis Dam Area • Jesus Ruiz Elizondo, Master's Thesis, CalTech, 1953. Human Remains Encountered During Construction: Green Valley, 1971 • News reports. FR2001 - Power House No. 2 Under Construction, ~1920. LW2845 - Correspondence from Man at Brand-New Power House No. 2, 6-21-1920. OV2401 - Newhall Land Letter to Mulholland Re: Water Rights, 8-22-1924. AP2329 - St. Francis Dam Under Construction ~1924. AL3034 - St. Francis Dam Under Construction ~1925. FILM: St. Francis Dam Under Construction in "The Temptress" • MGM 1926. LW2985 - St. Francis Dam Under Construction ~1925-1926. AP2330 - St. Francis Dam Under Construction, 1924-1926. AP2331 - St. Francis Dam Under Construction, 1924-1926. LW2081 - St. Francis Dam Under Construction, 1924-1926. AL3024 - St. Francis Dam Under Construction, 1924-1926. LW2986 - People Stand on Footbridge Over Forebay, 1926-1928. LW2574 - Woman at St. Francis Dam With Water in Forebay, 1927. LW2713 - St. Francis Dam With Water in Forebay, 1927. LW2714 - Power House No. 2 and Clubhouse, 1927. SR2701 - Baby Book of Richard Bruitt Smith, b. 3-14-1927; St. Francis Dam Entry. AP2332 - St. Francis Dam With Water in Reservoir, May 1926-March 1928. MF2601 - Walking Across Top of St. Francis Dam, 1926-1928. JB2801 - Power House No. 1 Employee Time Book for 1928. 18 Pages. LW3042 - St. Francis Dam Intact, George Watson Photo ~1926. LW3184 - Sun Rays Penetrate Storm Clouds Over St. Francis Reservoir, 1927. LA2801 - St. Francis Dam Intact ~1928. HC2801 - Dam: Plugging Leak with Sloppy Cement, 2/1928. HC2804 - Face of the St. Francis Dam, 2/1928. HC2806 - St. Francis Reservoir, 2/1928. HS2809 - St. Francis Dam Shortly Before Its Collapse. AL2024 - St. Francis Dam Before the Break, circa March 1928. HS2808 - (Formerly) Last Photo of the St. Francis Dam Intact, 3-9-1928. DI2802 - Another Copy: St. Francis Dam Intact, 3-9-1928. AS2801 - San Francisquito School, 3-9-1928. GM1928 - (Even Later) Last Photo of the St. Francis Dam Intact, 3-11-1928. LW2403 - Damkeeper Tony Harnischfeger & Family, n.d.
LW3321 - Initial Associated Press Wire Photo, Distributed 3-13-1928. Coroner's Inquest in the News: Witnesses Report Leaks News reports, 1928. HS7074 - Coroner's Jury Inspects Dam Site, March 1928. LW2822 - William Mulholland, Coroner Frank Nance, Others, at Hall of Justice, 1928. FILM: Pathe Newsreel Footage of Broken St. Francis Dam and Story of Pilot Who Died Getting It, 3-13-1928. SP0000 - Dam & Power House Before & After Failure, 1926-1928, 20 Views. AS2802 - Survey Map: Flood-damaged Properties, San Francisquito Canyon, 1928. WS2801 - Cleanup at Power House No. 2, March 1928 (Oversized). CG2801 - St. Francis Dam Disaster, Photos shot March 13, 1928 (10 Views). LW2642 - St. Francis Dam Disaster: Ruins, 17 Views, Ex-San Francisco PUC Archives, ~3-13-1928. AP2333 - St. Francis Dam Failure, March 1928. AL3029 - St. Francis Dam Failure, Inspecting Ruins of the Dam, March 1928. AL3030 - St. Francis Dam Failure, Ruins of the Dam, March 1928. LW2179 - St. Francis Dam Failure, Aerial View, March 1928. AL3028 - St. Francis Dam Failure, Aerial View, March 1928. DR2813 - St. Francis Dam: West Abutment & Wing Dyke, March? 1928. HS2810 - St. Francis Dam: West Abutment. WS2802 - Empty Reservoir, March 1928. LW2741 - Empty Reservoir, March 1928. DI2815 - Empty Reservoir, March 1928. LW3083 - Ruins of St. Francis Dam & Empty Reservoir, George Watson Photo, March 1928. GR0840 - St. Francis Dam Floodpath, 1928. LW3493 - Lower San Francisquito Canyon, Aerial View, 1928. DI2811 - Floodpath & Rubble Just Below the Dam, 1928. LW2743 - St. Francis Dam Floodpath, about a mile below the dam. AS2804 - List of Employees' Automobiles Wrecked in Edison Camp at Kemp, LADWP Archive. WF2800 - St. Francis Dam Disaster, 6 Contemporary Photo Postcards Including Generators, 1928. AL2020 - St. Francis Dam Disaster, Castaic Bridge Wreckage, March 1928. LW2997 - Wreckage of Steel-Truss Bridge. AL2021 - St. Francis Dam Disaster, Flood Victims Crossing River, March 1928. AL2022 - St. Francis Dam Disaster, Rescue Party, March 1928. AL2023 - St. Francis Dam Disaster, Search Party, March 1928. LW2207 - St. Francis Dam Wreckage, March 1928. HS7044 - Photo Gallery: Wreckage at Kemp Station/Blue Cut, L.A.-Ventura County Line, March 1928. HS7067 - SoCal Edison Saugus Substation After the Flood, March 1928. HS7050 - Photo Gallery: Bardsdale-Fillmore-Santa Paula Flood Damage, March 1928. HS7050 - Photo Gallery: Fillmore-Bardsdale Flood Damage, March 1928. LW2821 - Woman Sifts Through Wreckage at Santa Paula Home; Plus 10 Images, 1928. AL3043a - St. Francis Flood Damage, Santa Paula, March 1928. AL3043b - St. Francis Flood Damage, Santa Paula, March 1928. LP2803 - St. Francis Flood Damage, Santa Paula, Thomas Ward Photos, 2 Views, 4-8-1928. LW3496 - Dam Site & Santa Paula Damage (8) | ex-Ruth Teague. DI2812 - Wrecked Farmhouse in Santa Paula? 1928. DI2801 - St. Francis Flood Damage: Upended SP Train Track, 1928. HS7038 - Controlled Burn of Flood Debris, March 1928. RO2803i - Aerial View of Flood Path (x3). RO2803c - High Water Mark, Oberg Siding. RO2803d - Southern Pacific Tracks Moved. RO2803b - Southern Pacific Track Erosion. RO2803a - Highway Pile Driver in Use. RO2803e - Highway Pile Driver in Use. RO2803f - Highway Pile Driver in Use. EJ2801 - Wreckage at Kemp. EJ2803 - Wreckage at Kemp. EJ2804 - Wreckage at Kemp. EJ2805 - Wreckage at Kemp. EJ2806 - Man Observes Wreckage at Kemp. EJ2802 - SPRR Pile Driver, Castaic Junction. EJ2807 - Auto Bridge at Castaic Junction, 2 Views. DI2804 - Concrete Dam Rubble, 2 Views. AP0115 - St. Francis Dam Hero, 1928. FR2801 - Hap-A-Lan Hall (Masons) in Newhall as Morgue for Dam Victims, Exterior, March 1928. LW2715 - Dam Victims' Bodies Fill Newhall's Masonic (Hap-A-Lan) Hall, 2 Views, March 1928. LW3084 - Wm. Mulholland Inspects St. Francis Dam Disaster Site, Watson Photo, 3-14-1928. LW2055 - Wm. Mulholland & Harvey Van Norman Inspect St. Francis Dam Wreckage, 3-15-1928. LW2479 - Red Cross Relief: Shelters, Soup Lines, Nurses, Hospital. 7 Views. ID2101 - Lyman & Lillian Curtis, St. Francis Dam Victims, 1921. ID2101 - Marjorie, Mazie & Danny Curtis, St. Francis Dam Victims, 1926-1928 (Multiple Views). FC1101 - Joseph Gottardi and Frances Abalos, Wedding, 1-13-1912. FC2101 - Survivor: Alvina Gottardi (Guadagno), Photo Gallery. FC2401 - Victims: Reno, Joe Jr., Richard Gottardi, Ages 13-10-8. NL2819 - Joe Gottardi Searches for Family Members, 3-18-1928. NL2820 - Friends Search for Joe Gottardi's Family, 3-18-1928. LW2244 - Graves of Gottardi Family, St. Francis Dam Victims (mother & five children), d. 3-13-1928. Alvina Gottardi's 1930 Fillmore High School Yearbook. FC4001 - Survivor Joseph Gottardi, Post-Disaster, n.d. Survivor's Guilt: PTSD Wrecks Lives the Floodwaters Spared • by Dianne Erskine-Hellrigel, 2-6-2018. LW2731 - Saugus Community Club Plaque for 7 Members who Perished in the St. Francis Dam Disaster, 1928. HC2802 - Crowds Flock to the St. Francis Dam Tombstone, 2 Views, 1928 (Helena Carter collection). DI2806 - Crowds Flock to the St. Francis Dam Tombstone, 1928 (Sharon Divis collection). DI2819 - (2) Tourist Photos of the Tombstone with Ladder, 1928 (Sharon Divis collection). HB2802 - Visiting the "Tombstone," March 1928. HB2803 - Visiting the "Tombstone," Reservoir Side, ~1928. DI2816 - Unidentified Person Climbs the St. Francis Dam Tombstone, 1928. DR2817 - St. Francis Dam: Tombstone & Perimeter Road, 1928. DI2803 - Tombstone, Inside Looking Out, 1928. HC2805 - Tombstone & Fallen Section, 1928. HC2807 - Toppled Section of Dam, 1928. DI2818 - St. Francis Dam Ruins: Block 5 (1928). HC2808 - Western Abutment After the Break, 1928. LW2944 - Ruins of St. Francis Dam (Wing Dyke & Tombstone), View Into Reservoir, 1928-29. ES1928 - St. Francis Dam Disaster, Photos shot April 8, 1928 (11 Views). AL3042 - St. Francis Dam Failure, Real Photo Postcard, Ruins of the Dam, April 13, 1928. DI2807 - Picnic at Dam Disaster Site, ~1928-1929. HS7029 - Billboard for 1928 Dam Movie. HB2801 - Gold Badge Awarded to Officer Thornton Edwards, 1928. LW31929 - Film Clip: Thornton Edwards in "The Grapes of Wrath," 1941. LW3509 - St. Francis Dam Hero Thornton Edwards Co-Stars in 1946 Cisco Kid Picture, "Robin Hood of Monterey." JB2804 - Louise Gipe, Switchboard Operator, Disaster Heroine, 1928. DI2808 - Power House No. 2 Reconstruction: Rigging Temporary Power, 1928. DJ2801 - Power House No. 2 Reconstruction: Job Site, 1928. DI2809 - Power House No. 2 Reconstruction: Naked Generators & Penstocks, 1928. HS7066 - Power House No. 2 Reconstruction: Construction Camp, Top View, 1928. DI2810 - Power House No. 2 Reconstruction: Construction Camp, 1928. HS2811 - Telephone Company Crew, 3 Miles West of Castaic Junction, ~1928. RO2801 - Temporary Reconstruction of Auto Bridge Over Santa Clara River at Castaic Junction, 1928. RO2802 - Map of Flood-damaged Bridges in Santa Clarita Valley. The Last Dam Victim: Youth Dies After Falling from "Tombstone" • News reports, May 1929. LW3279 - Preparing to Blow Up the Tombstone, 4-16-1929. Dam To Be Toppled to Earth • The Signal, 4-18-1929. Dam Crumbles • The Signal, 5-30-1929. FR3001 - Power House No. 2 Employee Housing at Stator Lane, n.d. (1930s-1950s). RJ1000 - Raggio Ranch, c. 1940s. RJ1010 - Raggio Ranch, c. 1940s. JB4001 - Artifact: Newhall Dairy Farms Milk Bottle, ca. 1940s, Found 10-15-2013. RJ1010 - Joseph and Della Raggio with King Snake at Raggio Ranch, ~1940s. RJ1000 - Preparing Vittles at Raggio Ranch in San Francisquito Canyon, ~1940s. Nuclear Power Plant Planned for Saugus-San Francisquito • News Reports 1960. AP2321 - The Gold Bowl, 1963. AP2322 - The Gold Bowl, 1963. LW3095 - Phillips Ranch, 3-5-1964 (R.5). LW3102 - Phillips Ranch Restaurant, 3-5-1964 (R.6). HS0101 - St. Francis Dam Site, January 2001. LW2100a - St. Francis Dam: Wing Dyke Ruins (2 Views), 3-11-2001. LW2100c - St. Francis Dam: Ruins at Base, 3-11-2001. LW3198 - St. Francis Dam Site: National Register of Historic Places Nomination, Rev. 6-3-2004. Photo Gallery - Ruins of Structure on Tucker Ranch, 10 Views, 5-5-2014. HB1402 - St. Francis Dam Rubble, 11-14-2014. Sellout Crowd Revisits 1928 Tragedy • Dianne Erskine-Hellrigel, SCVHistory.com 3-12-2016. Angeles National Forest Copper, Ranch, and Sayre Fires Restoration Strategy • 2016. Graffiti Removal at St. Francis Dam Site • 2-28-2017. Annual SCVHS St. Francis Dam Disaster Lecture (Video) • 3-11-2017. Annual SCVHS St. Francis Dam Disaster Tour (Photos) • 3-11-2017. Drone Video: St. Francis Dam Disaster Site • Danny Sullivan, 3-12-2017. 3 Minutes to Midnight at the Dam • Jim Harris, 3-13-2018. Candlelight Memorial in Santa Paula • March 12, 2018. California Oil Museum Exhibit Highlights "Lessons Learned" from St. Francis Dam Disaster • 3-5-2018 through 7-8-2018. AS1801 - Victims Memorialized at Lancaster Cemetery • March 12, 2018. LW3200 - Santa Paula Creates River of Light for Dam Victims • March 12, 2018. Commemorative Events in Fillmore • March 17, 2018. VIDEO - County of Los Angeles: St. Francis Dam Disaster Proclamation (March 2018). Historical Society Trio Lauded for Work to Remember Dam Victims • 1-28-2019. AL1301 - ARCHIVE FOOTAGE: Construction & Opening of L.A. Aqueduct, Mulholland, Etc., 1913. Complete Report on Construction of the Los Angeles Aqueduct (Illustrated) • City of L.A., 1916. BOOK - The Water Seekers, by Remi Nadeau (1950). Owens River Water Rights Obtained for Los Angeles Aqueduct • Los Angeles Daily Times, 07-29-1905. Los Angeles Aqueduct Opening Ceremonies • Los Angeles Times, 11-6-1913. L.A. Board of Public Service Commissioners Annual Report, 6-30-1923. The Los Angeles Aqueduct • Chapter 23, McGroarty's History of Los Angeles County, 1923. L.A. Board of Water & Power Commissioners Annual Report, 6-30-1929. Booklet: The Romance of Water & Power by Don J. Kinsey, LADWP Propaganda 1926, Rev. 1932. 100 Mules Commemorate 100th Anniversary of L.A. Aqueduct • SCVNews.com, 11-4-2013. "William Mulholland" Presides Over L.A. Aqueduct Cascades Centennial • LADWP, 11-5-2013. LW3203 - Map of Los Angeles Aqueduct and Adjacent Territory, October 1908. AP1313 - Lopez Station, 2 Views, ~1890 (Razed for Aqueduct ~1910). MW0901 - Completed L.A. Aqueduct Tunnel, Saugus Division, 1909. EC1801 - Photo Album: Los Angeles Aqueduct Under Construction, 1908-1913. LW2418 - L.A. Aqueduct Construction Crew with Dredger, 1910. LW2419 - Elizabeth Tunnel Construction (L.A. Aqueduct), 1910. LW2735 - Deadman Canyon Siphon Under Construction, Saugus, 1910. World's (Then-) Largest-Diameter Concrete Pipe Installed in Whitney Canyon • News reports, February 1910. AP2320 - Power House No. 1, ~1910. LW2839 - L.A. Aqueduct Construction Equipment, Owens Valley, 1908-1913. (28) Photos 2016. AL1101 - L.A. Aqueduct Worker Sends Postcard to Mom from Jawbone Division (Mojave Desert), 1911. LW2420 - Jawbone Siphon (L.A. Aqueduct), Early 1910s. AL2092 - Jawbone Siphon (L.A. Aqueduct Right of Way), ~1912. LW3171 - Jawbone Siphon, Souvenir Postcard, ~1960s. LW2840 - Jawbone Siphon, 3-27-2016 (26 Views). AL1201 - Letter of Recommendation from Concrete Supt., Sent from Surrey, 1912. LW2734 - Cement Mixing Plant at South End of Newhall Auto Tunnel, ~1912. AL2091 - Power House No. 1 Under Construction, 11-1-1915. AL1913 - Invitation to Opening Ceremony, Owens Valley-Los Angeles Aqueduct, November 5, 1913. AL1951 - Los Angeles Aqueduct, Opening Ceremonies, November 5, 1913 (8 Views). RI1301 - Harrison Gray Otis & Ellen Beach Yaw at L.A. Aqueduct Grand Opening, 11-5-1913. LW2983 - Souvenir Water (Bottle) from Opening of L.A. Aqueduct (11-5-1913), Multiple Views. AL1915 - Los Angeles Aqueduct Cascades, 1915. AL1918 - Terminus of the Los Angeles Aqueduct, March, 1918. The Los Angeles Aqueduct (Map and Facts) • Bullock's Advertisement, L.A. Times, 3-8-1926. AL2063 - Bouquet Canyon Dam under construction to replace the St. Francis, press photo, 8-24-1933. LA3401 - Bouquet Dam & Reservoir Under Construction, 4 Views, 1933-1934. AL1959 - Oil Wells and Los Angeles Aqueduct, Placerita Canyon, 1940s-50s. LW2502 - Los Angeles Aqueduct in Placerita Canyon, 2 Views, 2013. LW2548 - Cascades: 1971 Earthquake Damage. LW2514 - L.A. Aqueduct Centennial Garden Opens at Mulholland Memorial Fountain, 10-23-2013. LW2510 - Christine Mulholland at L.A. Aqueduct Centennial Celebration, 11-5-2013. Photo Gallery - L.A. Aqueduct Centennial Celebration at Cascades, Multiple Views, 11-5-2013. Photo Gallery - Cascades Open for L.A. Aqueduct Centennial, Multiple Views, 11-9-2013. Photo Gallery - William Mulholland Memorial Fountain & L.A. Aqueduct Centennial Garden, Multiple Views, 11-10-2013. LW2797 - Wealth & Water for L.A.: Owens Lake Views; Relics at Keeler, 5-22-2015 (40 Views).